As you read this, you are taking advantage of an invaluable communications tool that has its roots in ancient Mesopotamia 3000 years ago: the written word. But accepted therories on the origin of writing are in question since a 1998 discovery. At the time Reuters reported a German archaeologist’s Egyptian hieroglyphic find which gave rise to the questions. Sumerian is the oldest literature in history. Sumerian inscriptions, in cuneiform, have been found on numerous pieces of pottery, clay cylinder seals, and clay tablets. Over a period of ten years, researchers from the institute discovered Egyptian inscriptions on about 300 pots and labels at an ancient royal cemetery called the “Mother of Pots” – so named because of its rich pottery work – in Abydos, about 400 kilometres south of Cairo. 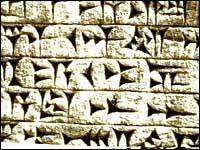 Some of the writings date back to 3400 BC which precede the Sumerian script – spoken and written in what is now Iraq and eastern Syria – by 400 years. And not only did the Egyptian inscriptions precede the Sumerian script, they were more advanced and readable, says Dreyer. The Egyptian writings were of animals, plants and mountains. So was writing invented in Egypt or in Mesopotamia? That’s still unclear. But the finding raises the possibility that Sumerians, who traded with Egypt, copied Egyptian inscriptions, says Dreyer. About two-thirds of the inscriptions have been deciphered so far and Dreyer says they will continue with the excavation of the cemetery, which will likely take another ten years.